We’d love your help. Let us know what’s wrong with this preview of The Fog by Kyo Maclear. To ask other readers questions about The Fog, please sign up. I won this book at LibraryThing in exchange for an honest review. I’d originally learned about this book from a friend who works at a children’s bookstore in New York City. The word that first comes to mind is charming. It’s very charming. The illustrations make this book. 5 full stars. They’re gorgeous and whimsical and lovely. Very special! The story is okay. I loved the part regarding the bird who is a human watcher. That was genius, as were all the illustrations about types of humans. It’s als I won this book at LibraryThing in exchange for an honest review. The story is okay. I loved the part regarding the bird who is a human watcher. That was genius, as were all the illustrations about types of humans. It’s also a sweet inter-species friendship story. If this is a message story though, about global warming specifically and about taking action and about galvanizing a group of beings to become aware of a problem and to do something about it, well something major felt lacking to me. For young children, they’re going to love the pictures and maybe the story in a superficial way, I think, and that might be fine, and enjoyable. But that’s as far as it goes for me. I think because I love fog before I started reading I was thinking of the fog as a positive thing. While I love promoting awareness and a pet peeve of mine is denial, I just don’t understand what I think might be the message. If the message is that friendships can brighten the lives of those in them then okay; that’s a good message. If working together is a message, ditto to that. Otherwise what everybody actually does makes little sense to me regarding extrapolating it to anything else. The author and illustrator bios section on the back cover are highly entertaining. I’m a huge fan of creative bio sections so I really appreciated this one. Because I won this at LibraryThing the publisher is entitled to my review at LibraryThing and I also post an identical review (shelves might differ slightly) at Goodreads. If I get a note asking me to email someone with comments or links to the URLs of my review I happily comply. In this boo there is a card included that has book information and a snail mail address to the publisher(s) in Toronto, Canada. I'm in the U.S. Except for the book info and snail mail publisher info, the only other line is "We would appreciate two copies of your review." There is no name for attn: to or any other info besides the Randomhouse Canada and Tundra books address in Toronto. Am I expected to print out 2 copies of the review and mail it to an out of the country generic address, with no name to put attn to?! Do they not have a printer and email?! I also have no person to contact to ask if links to the URLs could be included in an email, which I'd be happy to do. And, I am NOT a professional writer! If this was to be an included requirement I would have to stop entering to win books. Icyland is a special place that people like to visit and the home of Warble, a small yellow bird who loves to human watch. When a deep fog rolls in and lingers the other birds don't seem to mind but Warble becomes concerned. It's not until a Red-hooded Spectacled Female (Juvenile) also notices the fog that Warble decides to do something about the spreading menace. What a gem of a book this turned out to be! I was drawn to the watercolor and ink sketch illustrations right off, and they are beautiful. They carry through the entire book blowing you away. You literally feel like you've been to Icyland and experienced the fog with Warble and the Red-hooded Spectacled Female (Juvenile). I loved the fact that this little girl was drawn as an Asian girl! We don't see that in picture books much... and its so important that we see that more. "Happy to see a human again, Warble offered insects to eat. I enjoyed how this turned out to be such a big story. First Warble makes a human friend and then together they make change. They don't know how to do it at first and they have to keep trying but slowly they get results. Such a huge lesson for children to learn. It's so hard to stand alone but if you seek out others who feel the same way as you do then change is possible. There is also a great segue into talking about the environment and seeing others despite their being different from you. Most surprising was how much my nephew loved this book. Right away it appealed to me visually and later as a message story, but would my little nephew enjoy the watercolor and ink sketches and the foggy subject? Yes! He totally loved the paper boats and the relationship between the bird and the girl. He always picks a spread and draws his own version of it. I felt certain he would pick the insects part because he thought that was so funny but no he chose the big message spread! I was really taken aback but I shouldn't have been. At the heart of the story is two friends who wanted to fix a problem that the two of them alone couldn't fix. There's power in friendship! I totally can see you buying this for a small child and the story growing with them as they age and understand the world on a deeper level. The messages are powerful and merit purchasing the book so they can be repeated often in the home. BOTTOM LINE: Not just for bird lovers, but also for cause movers and shakers! Warble is a bird and also a human watcher from the Icy Land. But one day the fog spreads over the land turning everything ghostly, and he is not able to watch people anymore. Warble knows something is very wrong, but nobody else seems to notice or care. He tries to blow the fog away, but it doesn't work. Warble is really worried. Then is when he finds a little girl who is also concerned about the last changes and signals. They decide to find other people around the world who are also aware of wh Warble is a bird and also a human watcher from the Icy Land. But one day the fog spreads over the land turning everything ghostly, and he is not able to watch people anymore. Warble knows something is very wrong, but nobody else seems to notice or care. He tries to blow the fog away, but it doesn't work. Warble is really worried. Then is when he finds a little girl who is also concerned about the last changes and signals. They decide to find other people around the world who are also aware of what is going on. They send messages in paper boats, and they receive lots of answers. They are not alone, and with each new reply they get, the fog lifts a little more. I liked the premise of this story, and absolutely loved the wonderful illustrations. I think there is a problem with the ending, which appears diffuse to me, specially considering this is a picture book for little kids. The message is that being aware of the environmental problem solves it. And even if this is partially true (the first step is to accept something is happening), it is also important to take action as a way to respond to the situation. The characters' action in this story is to find more people like them, what is valid, but thinking this will be enough to solve the problem is a tricky message. I still find Warble and his friend passive in front of the problem. Action from to solve the problem would have make this book a 5 stars for me. Maybe the idea is that for each person who understand we have a problem, the solution is a little closer, what is a fantastic message, but again, probably diffuse for the age range of the target of this story. Disclaimer: I received a copy of this book from the publisher via NetGalley in exchange for an honest review and I'd like to thank them in letting me read an advance reader's copy of The Fog by Kyo Maclear for its release. This book contains absolutely beautiful drawings, and the writing was mediocre. I loved that the bird, Warble, was persistent and tried to change something way bigger than himself. I liked that in such a minute size, it gave me good feelings. (view spoiler)[At times Disclaimer: I received a copy of this book from the publisher via NetGalley in exchange for an honest review and I'd like to thank them in letting me read an advance reader's copy of The Fog by Kyo Maclear for its release. This book is a bit wispy, like the fog. The pictures alone make it a four. 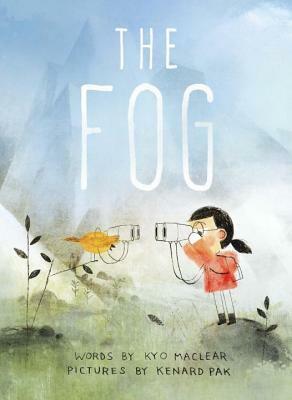 The narrative is a little odd, but it appears to be a story of "fog" taking over everything, and no one noticing, except for one little bird, and one little girl. And when they ask others, around the world, if they too see the "fog", it goes away, and things are beautiful again. I put the fog into quotes, because it seems to stand for something, but I am not sure what. Or I might be trying to read too much into a beautiful This book is a bit wispy, like the fog. The pictures alone make it a four. The narrative is a little odd, but it appears to be a story of "fog" taking over everything, and no one noticing, except for one little bird, and one little girl. Or I might be trying to read too much into a beautifully illustrated picture book, and maybe a cigar is just a cigar. What a timely, remarkable picture book. A must have for bird (and people) watchers. It is a great friendship tale but ever so much more. The illustrations are swoon worthy. The illustrator, Kenard Pak is an absolute treasure. The emotions, warmth and atmosphere he conveys through his art is outstanding. One of my favorite children's books of the year. I first tried reading this on my phone screen and frankly just didn't get it. What I could see was enough to make me try again on my computer--and oh, what a difference it made! With subtle humor and illustrations, this story definitely requires a close read. I don't recommend reading it on a smart phone screen--you miss entirely too much. On the surface, the story is a cute tale of a human-watching Warbler (whose i.d.s of said humans are hilarious). But then, enter The Fog. Only a few others se I first tried reading this on my phone screen and frankly just didn't get it. What I could see was enough to make me try again on my computer--and oh, what a difference it made! With subtle humor and illustrations, this story definitely requires a close read. I don't recommend reading it on a smart phone screen--you miss entirely too much. On the surface, the story is a cute tale of a human-watching Warbler (whose i.d.s of said humans are hilarious). But then, enter The Fog. Only a few others seem to notice it, but most just seem to accept it and move on blindly. Enter one red-hooded, spectacled, female (juvenile) human. And while somewhat lost, seems to see the fog--and Warbler--just fine. Maybe, if this unlikely duo can learn to communicate with one another, they can find some answers that, alone, they just weren't able to. Now, the English major in me itches to pick it all apart and see all sorts of allegorical, metaphorical, insanitorical meanings. Thankfully, I've shushed her and am letting my Library teacher self just savor this lovely, peaceful, gem or a story. I'll think about how to use it as a read-aloud (definitely with the document camera to project the pictures onto the ActiveBoard)--later. Great potential as a writing prompt. Ok, it's later. When I share this with my classes, I want to be sure to zoom in on Warbler's expressions as he tries, in vain, to get rid of the fog by himself. I absolutely love the subtle humor in Warbler's labels and in the illustrations throughout. This one's a keeper. Review based on an advance copy provided by NetGalley. As a mysterious fog envelops the countryside, the bird Warble is worried, but his fellow creatures seem oblivious or unconcerned. Finally, joint efforts by other creatures in other faraway places make the fog disappear. So, the message, such as it is, addresses global warming and the need for global cooperation. If that's all we had here I'm not sure I'd be terribly enthusiastic about this book, even despite its charming gentle full page drawings. Even gentle and upbeat messages can be heavy handed if that's all you have. But, there's something else going on here that's funny, sly and just the type of switcheroo that young readers can get and appreciate. Warble is an avid human watcher. He has human identification books. He keeps a life list. He looks for rare human sightings. The book takes off when he first spies a "Red-hooded Spectacled Female (Juvenile)", (check out the cover). I'm sorry, but that just cracks me up and it is absolutely in keeping with the style and feel of the drawings. Anyway, Warble and this juvenile female become friends and interact in kind, gentle and amusing ways. That, to me, was the heart and humor and grace of this book, and it made this a charming and happy find. Kenard Pak's illustration I came here for; I didn't exactly stay for Kyo Maclear's writing. Yet again, I am predictable. I do think the writing and humour of this picture book was very strong at the beginning of this picture book, perhaps the strongest writing I've seen from Maclear for a picture book, but by the end I feel like the story and plot strayed a little too much that I feel both children and parents would be confused and I'm not sure children are you know, looking for deep inner meani Kenard Pak's illustration I came here for; I didn't exactly stay for Kyo Maclear's writing. Yet again, I am predictable. I do think the writing and humour of this picture book was very strong at the beginning of this picture book, perhaps the strongest writing I've seen from Maclear for a picture book, but by the end I feel like the story and plot strayed a little too much that I feel both children and parents would be confused and I'm not sure children are you know, looking for deep inner meaning in a picture book. But I could be wrong. However, Maclear's interest in birds and birdspotting has made me interested in reading her non-fiction, and I feel like the cute twist on a bird people spotting may lead children to have their interest peaked by nature as well. I received an advance reading copy of this book from Penguin Random House Canada in exchange for an honest review. Warble is a tiny yellow bird who likes to people watch. When tourists come to Icy Island, Warble brings out his binoculars and takes note of the visitors; from the Behatted Bibliophilic Female to the Bald-Headed Glitzy Male, Warble observes them all. One day, a fog comes over the island and prevents Warble from people-watching. Frustrated by this interruption, he does all he ca I received an advance reading copy of this book from Penguin Random House Canada in exchange for an honest review. One day, a fog comes over the island and prevents Warble from people-watching. Frustrated by this interruption, he does all he can to send it away. Powerless to chase it out on his own, Warble befriends a lost tourist to figure out how they can get rid of the fog. The Fog is the story of one little bird trying to fix a problem much bigger than himself. I loved Warble's initiative and how he sought help when he couldn't do it on his own. Full of breathtaking illustrations by Kenard Pak, this book shows that when many come together for the same cause, big changes happen. This poignant and timely work shows the importance of championing a cause and fighting until it it solved, even if you aren't necessarily equipped to solve it. Warble the bird may not be an expert on the weather, but he can tell that something is wrong with the fog. While at first no one listens to him, he finally finds an ally in a little girl who also notices something is amiss. When they launch a global awareness campaign (in the form of origami letters into the ocean), more allies from aroun This poignant and timely work shows the importance of championing a cause and fighting until it it solved, even if you aren't necessarily equipped to solve it. Warble the bird may not be an expert on the weather, but he can tell that something is wrong with the fog. While at first no one listens to him, he finally finds an ally in a little girl who also notices something is amiss. When they launch a global awareness campaign (in the form of origami letters into the ocean), more allies from around the world take notice, and the fog eventually lifts. Even beyond the positive message, the work is beautifully illustrated, with spare text that doesn't overwhelm the page. It would work especially well as a group readaloud. Very cool; the art and text work well together. And it has amusing endpapers. Such a peaceful, wonderfully told, and beautifully illustrated story. Illustrator Kenard Pak brings this whimsical parable to life—a sort of Iceland where a yellow warbler sees things nobody else wants to notice. I especially loved the “human-watching” illustrations on the end paper and inside. The key message: that the first step to addressing a problem is acknowledging its existence. This is addressed in a lighthearted and humorous way. A little more about Pak...he started out as a visual development artist with DreamWorks and Disney, and has also illustrated chil Illustrator Kenard Pak brings this whimsical parable to life—a sort of Iceland where a yellow warbler sees things nobody else wants to notice. I especially loved the “human-watching” illustrations on the end paper and inside. A little more about Pak...he started out as a visual development artist with DreamWorks and Disney, and has also illustrated children's books such as Have You Heard the Nesting Bird? by Rita Gray and The Dinner That Cooked Itself by J. C. Hsyu. He lives in San Francisco with his wife and their three cats. Pak counts among his inspiration memories of nature, friends, family and random quiet moments. He is also inspired by the work of fellow illustrators and artists like M. Sasek, Richard Scarry, Roger Duvoisin and Adrienne Adams. Andrew Wyeth and Richard Bunkall are also important inspirations. This book is cute, but I felt like there was a deeper metaphor that I just wasn't understanding. Warble, a small yellow bird, enjoys people watching. I loved this concept of the animals watching us. He lives on Icyland island, but when a mysterious fog rolls in, he can no longer people watch. No other birds seem bothered by the fog. They all act as if it's always been there, but it bothers Warble. When a little girl shows up and notices the fog too, they send letters out into the sea looking for This book is cute, but I felt like there was a deeper metaphor that I just wasn't understanding. Warble, a small yellow bird, enjoys people watching. I loved this concept of the animals watching us. He lives on Icyland island, but when a mysterious fog rolls in, he can no longer people watch. No other birds seem bothered by the fog. They all act as if it's always been there, but it bothers Warble. When a little girl shows up and notices the fog too, they send letters out into the sea looking for others that can see the fog. At this point in the book I was really liking it. I thought maybe it was supposed to be about the destruction of the environment or something serious and important like that. But then the fog disappears when more and more letters come back saying others can see the fog. So perhaps it was about connection with other people? Maybe the prevalence of smart phones and our disconnection from each other? I kind of got lost. Maybe it's just a kids book without a deeper meaning. Either way, it was still a decent read, and the pictures were cute. The length of the text makes it appropriate for ages 4-8. I received a free copy of this book from NetGalley. I was not compensated in any other fashion for the review and the opinions reflected below are entirely my own. Special thanks to the publisher and author for providing the copy. This review may contain spoilers. The island of Icy Land is a popular tourist destination - and a small yellow bird named Warble likes to human-watch! He spends his days up in his nest, watching and documenting the different types of tourists that come to Icy Land. Howe I received a free copy of this book from NetGalley. I was not compensated in any other fashion for the review and the opinions reflected below are entirely my own. Special thanks to the publisher and author for providing the copy. This review may contain spoilers. The island of Icy Land is a popular tourist destination - and a small yellow bird named Warble likes to human-watch! He spends his days up in his nest, watching and documenting the different types of tourists that come to Icy Land. However, when a fog comes to the island that blocks Warble's view and keeps people from visiting the island, Warble loses his favorite pastime. When he encounters a lone little girl, will they be able to save the island from the fog? These scenes of the Fog with Warble diligently watching through his binoculars brings to mind the icy and foggy mornings Maclear describes when she was learning patience along the shores of Lake Ontario (Birds Art Life: A Year of Observation. She was trying to learn how wait for nature to come to her and found the experience difficult and exasperating. She also apparently got the idea to turn the tables on those very birds she was trying to wait for! Have you noticed that most of the books called "The Fog" are in the horror genre? I really don't know what to make of this book. Maybe a child would get it right away, but I am confused. Is the fog an allegory for something? Climate change? What about eating insects? Is that what we should be doing to salvage the planet? I enjoyed the charming illustrations. My favorite part was the cats from England responding about the fog and asking if the note was sent by a bird and "can we eat you?" I didn't quite this, so I gave it to my mother to evaluate. She says "Several books in one. She goes from one idea to the next to the next." That's certainly a valid viewpoint... the story about the human watcher is cute, the story about the friendship is nice, the story about reaching out to activists around the world is cool... but come on, what's wrong with fog? Just a weird little book. But hey, it's definitely original, so that's good! Beautifully illustrated, fun and funny. And I don't get it. The fog just needs people to notice it for it to go? Isn't there a mobilization step in there? If I understood it, this would be very highly rated, but I can't give a high rating for a kids book that I don't understand. Ahhhhh maybe I'm just stunned. A people-watching bird is hampered by a fog that rolls in from nowhere -- but nobody else notices or cares about the fog. Maclear uses quirky humor to disguise a perfect metaphor for life in the 21st century. Genius. Read it to your little ones; study it with your not-so-little ones. The Fog by Kyo Maclear is about beating something by putting your mind to it and collaborating and also about the environment. It is a beautifully illustrated picture book that will definitely start discussions.